This 800-car parking deck addition and data center achieves efficiency in structure and space while simultaneously engaging the urban fabric in a meaningful way. 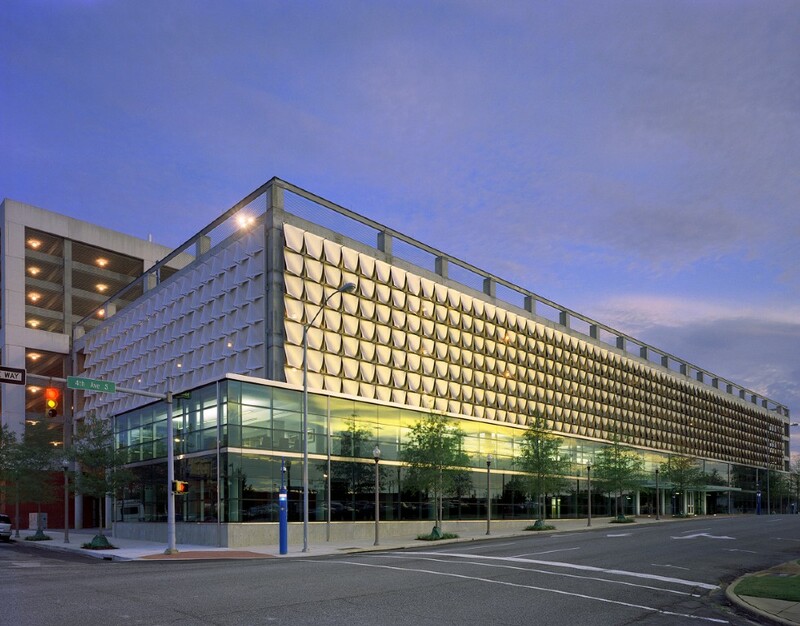 By utilizing the adjacent parking deck’s entry and ramps, the large parking volume of the addition was programmed above the street level, exposing the data center in a two-story bar of glass at the street front. Because of the massing limitations of the deck, the designers looked to materiality to further the building’s layering, to define the masses and their functions and to create a textural richness for the city. After studying digital and full-scale mockups, the architects developed a regular 5’x5’ perforated steel panel module, where the panels are virtually invisible from the interior yet opaque from the exterior. The glass box data center and the metal-clad deck offer city views to users and an ever-changing palette to passersby.